The thing about fried rice is that it's as versatile as versatile can be— even more than pizza (yes, we went there). With just a few pantry staples, healthy fried rice will meld an array of flavours and ingredients together in a matter of minutes. Use leftover brown rice. Prepare as much brown rice as you can anticipate yourself eating ahead of time. A rice cooker is an easy way to prepare large quantities of rice without having to fuss over a bubbling pot every few minutes. Refrigerate the rice in a large tupperware so that you have it ready to eat for any meal. Colder rice will separate easier, so that the grains will have a firmer texture after you cook it. Brown rice has more fiber than white rice, and it also stabilizes blood sugar levels. Go easy on the sauce. Too much soy sauce in your fried rice will impart a very salty taste, over-saturating the flavours of your other ingredients. Vegetables tend to absorb liquid sauces easily. They'll lose their crunch and taste soggy and salty if eaten the next day. If you're using soy sauce, opt for a low-sodium variety. Experiment with other bases. Not down with brown rice? Use alternatives such as quinoa and cauliflower. Both mix well with other ingredients and absorb light flavours without overwhelming the dish as a whole. Directions: Cook the brown rice in a rice cooker, or boil according to package instructions. Refrigerate overnight, then set 125 g aside for fried rice. Boil peas until it turns green and tender. Cook carrots, chicken, and ham together with vegetable oil or sesame oil. Make an omelette in a separate pan with the 2 eggs, and cut it into the carrot mixture. Mix in rice and peas, adding a bit of soy sauce to flavour the mixture. Peanuts, lime, ginger, and tumeric are what make this healthy fried rice recipe distinctly special. This is a protein-packed recipe that can be made vegetarian without the fried egg on top. 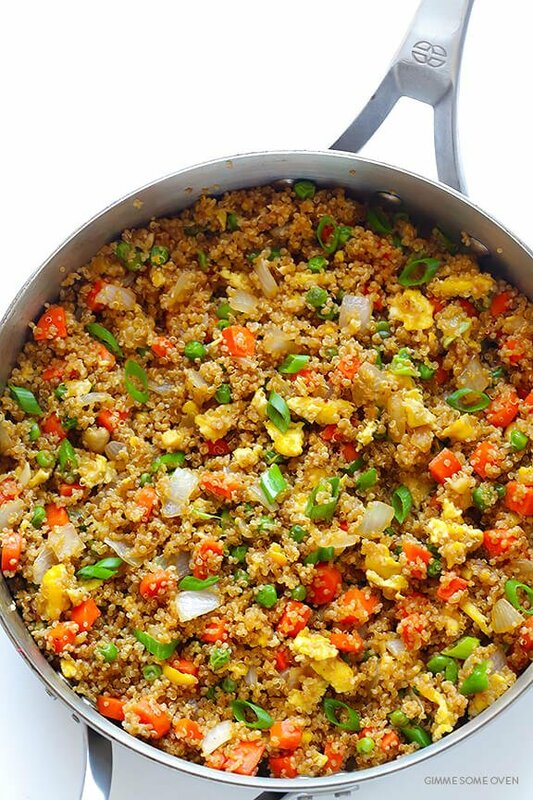 Add tons of vegetables to this Indonesian fried rice for an extra nutrient boost. Put the casserole away this Thanksgiving and don't let overly rich dishes kale your vibe. This filling, sweet, and absolutely genius wild rice recipe from Iowa Girl Eats is just the dish you need to impress a crowd. Kale offsets most of the saccharine flavour, making everything in this healthy fried rice recipe a match made in foodie heaven. 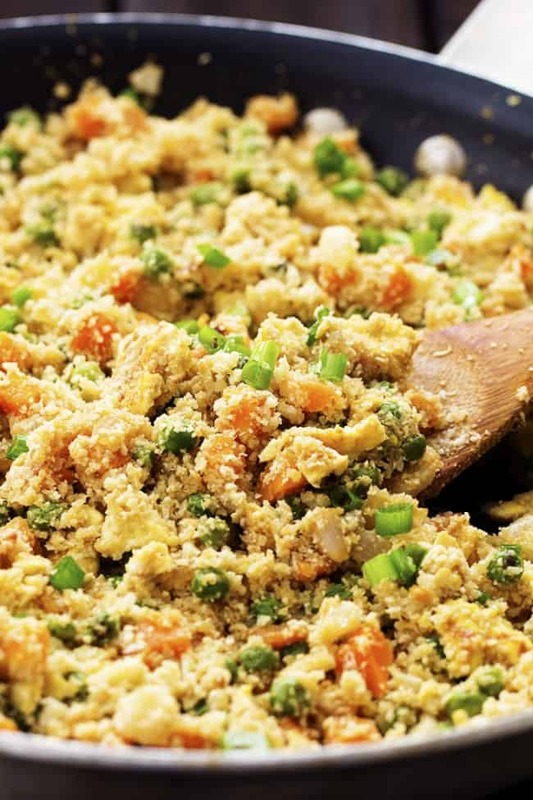 If you're laying low on the carbs, cauliflower fried rice is for you. With the help of a food processor and a wok, magic will happen in your kitchen. This healthy fried rice recipe from the Recipe Critic uses very few ingredients, but feel free to toss whichever leftovers you have in your own pantry. The vibrant colours in this healthy fried rice recipe make it too legit to quit. The best thing about quinoa is that it comes together more quickly than brown rice. Ali from Gimme Some Oven likes to cook it with vegetable stock and then spread it out on a baking sheet to hasten the cooling process before she places the quinoa in the refrigerator. When heated in a wok, quinoa takes on a toasty, nutty flavour that enhances the dish as a whole. Plus, one cooked 100g serving of quinoa contains as much as 4.4 grams of protein! Farro is a much denser grain than rice is (albeit a bit more difficult to cook). One serving of farro fried rice will leave you considerably more full than one serving of white fried rice, without the sugar crash. The puffy farro will soak up all of the flavours from the honey ginger tofu marinade, leaving a medley of happy tastes in your mouth. 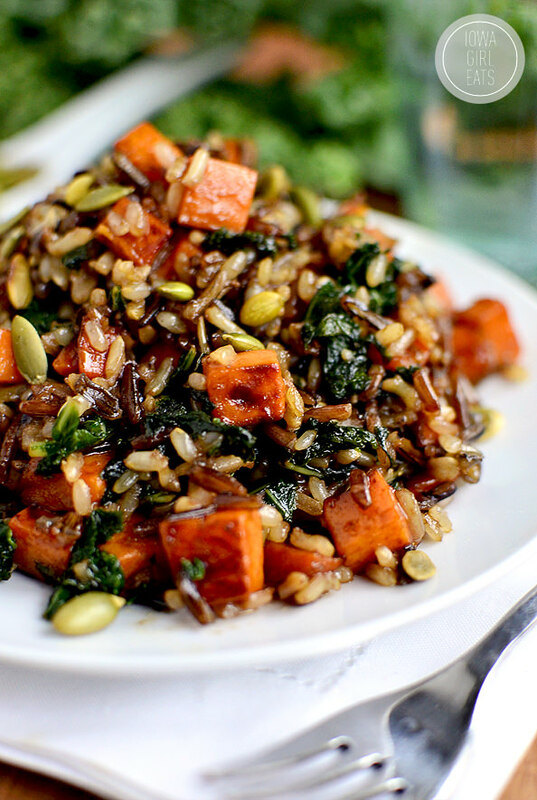 One cup of cooked farro contains up to 10 g of fiber and tons of protein to abate any hunger that might induce midnight cravings. Got a sweet tooth on the loose? 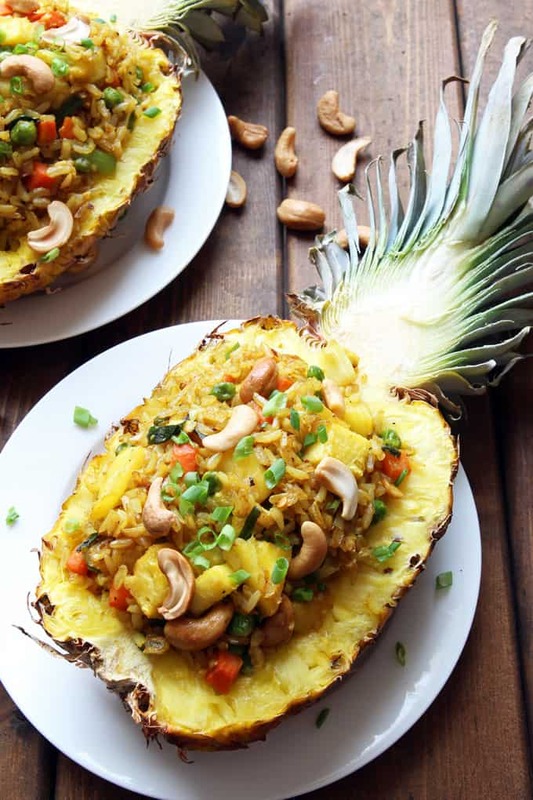 There's nothing more genius than this pineapple fried rice baked in a pineapple. It's not excessive, it's just extraordinary. Cooked with tumeric, coriander, unsalted cashews, coconut milk, and soy sauce, this healthy fried rice recipe is packed with rich flavours that don't won't bust your diet. How do you prepare healthy fried rice? Tag your best fried rice combinations on the PumpUp app and share them with the PumpUp community using the #TastyTuesday hashtag. Loved these healthy fried rice recipes? Let us know in the comments below!